Keep Your Friends & Family Pictures Coming! We’re still celebrating our 50th Anniversary all year long and this April will be a continuation of our family theme! We’re asking you to helpencourage your family and friends to donate blood by inspiring the next generation of blood donors! Whether it’s a sibling, child, or even a grandchild (who is at least 16 years old) talk to them about why you donate and how it makes you feel to help others. Then take it a step further by bringing them with you the next time you come in to donate and show them what saving lives is all about! One of the top reasons people give for having never donated blood is that no one ever asked them. So let’s ask! You might be surprised at the people in your life who just needed the nudge. 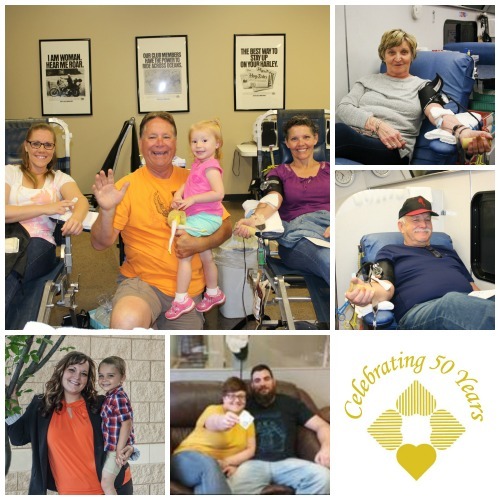 Start a new family tradition of giving this year, and help your family join our family by donating blood together! If you come in with a family member be sure to let our staff know so we can take your picture and share it to social media! Not eligible this month but still want to participate? Snap your own photo and share it with us via social media or email it to nleone@fourhearts.org. We’ll be happy to share it for you! 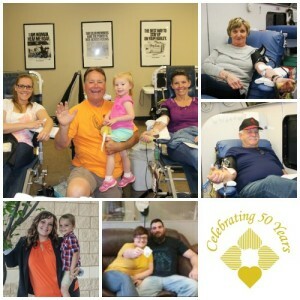 Walk with the Community Blood Bank: Prizes Revealed! As many of you know by now, the Community Blood Bank is participating in the Highmark Walk for a Health Community this June. This walk will allow us to raise money which will be put towards the purchase of a second bloodmobile. This second bloodmobile (a friend for Gus, our current bloodmobile) will allow us to better serve our donors by giving us the ability to hold more mobile drives than what our current resources allow. And don’t forget! Once you’ve registered to walk, if you raise $20 you’ll receive a t-shirt from CBB! But wait, there’s more! If you raise $30 you’ll receive a t-shirt from Highmark in addition to the t-shirt from us! And the first 100 walkers will receive a reusable water bottle from CBB. For every $50 a registered walker raises/donates, you’ll be given a chance to win one of these prizes from Highmark! So let’s tally this up. If you register to walk and raise at least $50 you’ll receive a water bottle, two t-shirts, and a raffle ticket to win one of Highmark’s big prizes! That’s a lot of goodies! We’ll be hosting other fundraisers with other organizations throughout the next few months, including one on April 7th with Arby’s locations in Erie! Make sure you keep an eye on your email for details! We’ll be offering sneak peeks at promotions via text, be sure to opt in for early details as the summer months approach! Only 861 of our donors have opted in, make sure you join them in being the first to know! Don’t worry, we won’t text you at all hours of the day, and we promise not to over use this feature, but keep in mind these messages aren’t just about promotions, they’re about helping patients when time is precious! If you still haven’t opted in to receive text messages, please text the word BLOOD to 444999. Our ability to reach you quickly could make a world of difference for a donor in need. According to MobileSquared, over 90% of text messages are read in three minutes, compared with just 22% of e-mails in that same time frame. Thank you to our GR8 GIVERS group from this month: Stairways Behavioral Health! As a reminder, GR8 GIVERS takes place year round, and groups can consist of family, friends, co-workers, neighbors, classmates or members of your church. Once your group of 8 (although more are always welcome!) have signed in and donated during your selected week, you’ll automatically be entered into a drawing for a $100 gift card for breakfast or lunch for your group! Already have your group selected? Simply contact Deanna Renaud, Director of Donor Services for Community Blood Bank, at drenaud@fourhearts.org OR at (814) 456-4206 to reserve your week! Congratulations to Chuck, a Platelet donor, who won the $100 gift card in February! One winner is selected at random from the point store drawing each month, you can enter as many times as you’d like each month OR you can redeem your points for something tangible like a coffee mug, t-shirt, or gift card. Your points are yours to use as you’d like, happy shopping! Looking for something fun to do with a spouse or friend? How about going to see David Sedaris at the Warner Theater on April 11?! We still have some tickets available on our point store, but only until Monday, April 4th! Tickets are redeemable in pairs or as a single ticket, hurry to get yours! As a reminder, even if you haven’t created your Donor Portal account you are still earning points! Community Blood Bank staff is happy to assist you in creating an account or redeeming your points.